As you may recall, I mentioned that my zombie series The Hollows was being adapted into a graphic novel. For the past several months, I have been working with Dynamite Comics and writer Tony Lee and artist Steve Uy, and now it’s finally being released as Amanda Hocking’s The Hollows: A Hollowland Graphic Novel, and I think it turned out pretty fantastic. Now I am going to answer a few questions that you may have. Welcome to the world of the best selling novel Hollowland as never seen before – adapted and enhanced by #1 New York Times bestseller Tony Lee (X-Men Unlimited, Doctor Who), with superb artwork by Steve Uy (Avengers Initiative, JSA Classified). It’s Day One as a new pandemic sweeps the globe, and all over the world people are turning into mindless zombies. But for five people – siblings Remy and Max King, med student Blue Adams, rockstar Lazlo Durante and teenager Harlow Smith – it’s the start of a journey that they can never return from! Learn for the first time how the characters of Hollowland started their journeys as we go back to the very beginning of the story. 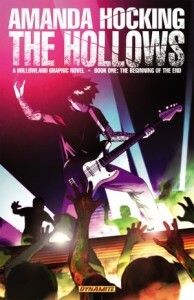 Dynamite Entertainment presents Amanda Hocking’s The Hollows: A Hollowland graphic novel. It’s really cool, because it allows people who’ve never read any of the books to jump in, but it also always fans of the series to see something different. You can also read more about the whole collaboration from this piece at Publisher’s Weekly. It will be a 10-part series, released in digital-only installments, but it will be out in one full print graphic novel toward the end of this year or early 2014. Part 1 & 2 are up now, with Part 1 being FREE. Why did you do this instead of writing a third book? This isn’t an either/or scenario. It’s like how you get presents for Christmas and for your birthday. One doesn’t cancel out the other (unless your birthday is on Christmas, in which case, I’m sorry). This was something that I did in conjunction in with Dynamite Comics during a period of time when I was not and would not have been working on a third Hollows book, whether there were comics or not. I don’t like graphic novels. Is there another way I can read this? I think these are amazing graphic novels and everyone should give them a chance, but I understand that some people don’t like them. But let’s put this another way. Let’s say you’re a huge fan of Charlaine Harris’s Southern Vampire book series, but you absolutely loathe TV, so while you want to read more books, you don’t want to watch True Blood. That’s okay. You can still enjoy the books without watching True Blood, but there really isn’t another way of getting the content from the TV show without watching it. It’ the same way with the graphic novels. It’s an adaptation of the novels.